The Bulldogs’ Joy Victor drives past the Eagles’ Tifhany Jennings under the basket during Saturday’s game. 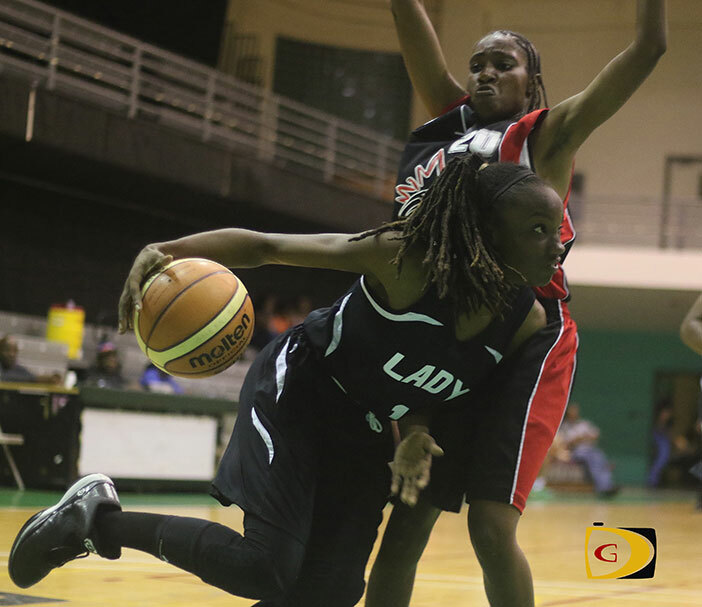 There was a semblance of a Women’s Basketball League in the early 90s’ but, it fizzled as there was no girls basketball school program in place, feeding into the BVI Basketball Federation League. However, after fielding a women’s team in the CBC Championships for the first time in its history a year ago, a women’s league is underway with three teams as more women interested and playing the game at the Primary and High School levels. The rosters—consisting of past, current and future players, range in age from their teens to 52 and include two referees—one of whom is playing on a team with her daughter. On Saturday, the Bulldogs used 13 points from captain Khadejah Anthony and 10 from Dominique Wattley to claw the Eagles, 55-27, for their second victory of the season after holding off the Rams, 47-38 in their opener. Thomas recalled playing in the league in the early 90s. “Seeing it renewed after 21-22 years, is something nice to see,” she said. Defending champions Legs had a 16 points 86-70 victory over All Ah We. Dion Blyden was the leading scorer with 26 points. Devon Peltier had 21 points to lead All Ah We. Nigel Carey recorded a game high 30 points and 13 rebounds but it wasn’t enough to help Zero Tolerance as they fell to the East, 90-74. Shaheed Collins paced the East with 29 points. The Kings used Kellvin Solomon’s 26 points and 11 rebounds double double to beat the Skulls, 80-73. Jehmaery Benjamin led the Skulls’ scores with 15 points. In Jr. Division play, Jachoy Walwyn led six players in double figures with 18 points as And One crushed Young Starz—who had no players scoring in double figures—105-34. Another Level got 22 points from Deangelo Sampson during a 90-59 triumph over the Celtics.